Maple, ON—In my fifteen years of chiropractic practice, I have seen thousands of people come to our office seeking relief from their pain, whether it be back pain, neck pain, arm tingling/numbness, leg pain/sciatica, or headaches. Also, I have noticed that people who are in pain are also stressed out. The common thread is that all people are seeking for answers and solutions to their health problem, to conquer their stress, and to better their health, but they are falling short from receiving the solutions their truly need. When patients come to my office for chiropractic care, often times they have tried everything else, like drugs, physiotherapy, massage therapy, specialists appointments, and they received many special tests, like MRI’s and CTs. It’s remarkable that after all that seeking, they are still suffering from the same pain, stress, and health issues. What I do differently is that I help guide our patients to better health by leading them to make a choice for healing, a choice for health, and provide them the vehicle that has worked for many others—chiropractic care. Chiropractic care has offered millions of people around the world a practical form to healing. 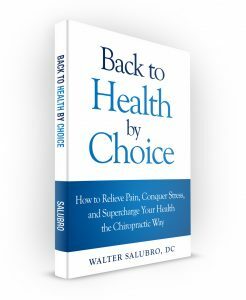 It is my purpose with my new book, Back to Health by Choice, to lead the reader to this same point, to make a choice for healing and to discover the chiropractic way to relieve pain, conquer stress, and bettering health. As you read Back to Health by Choice, you will be moved and inspired by the many stories and case examples of how people have transformed their life and their health with chiropractic care when they made a choice for healing. The book will be released in the summer of 2015, in a few short weeks. Look out for the release notices on this website, and on our many social media platforms, like www.facebook.com/backtohealthcc, www.youtube.com/backtohealthcc, and www.twitter.com/backtohealthcc. Re-posting this article on your website or blog is permitted only if you credit the author, Dr. Walter Salubro and post a backlink to www.iBTHCC.com. Suggested attribution: Article courtesy of Dr. Walter Salubro at www.iBTHCC.com. 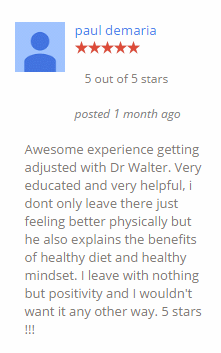 Dr. Walter Salubro is dedicated to providing the highest quality chiropractic care for all of his patients. He is a 1999 graduate of the National College of Chiropractic and certified from the Academy of Chiropractic Family Practice and the Council on Chiropractic Pediatrics (C.A.C.C.P.). Dr. Walter Salubro is Webster Technique Certified, certified and recognized by the International Chiropractic Pediatric Association (ICPA). Dr. Salubro caters to the specialized care of infants and pregnant mothers.